For 30 years, I have had the great joy and opportunity to know and love all four of my grandparents. I think it's a rarity that someone at the age of 30 still has each of their grandparents and it is one of my most cherished blessings. This past week, I had to say my first goodbye to a grandparent, Grandpa James. There is a bond that a grandchild has with a grandparent and when that is broken by death, it hurts deeply. Grandpa was kind, gentle-hearted, patient, handsome, intelligent, talented, hard-working and loving man! 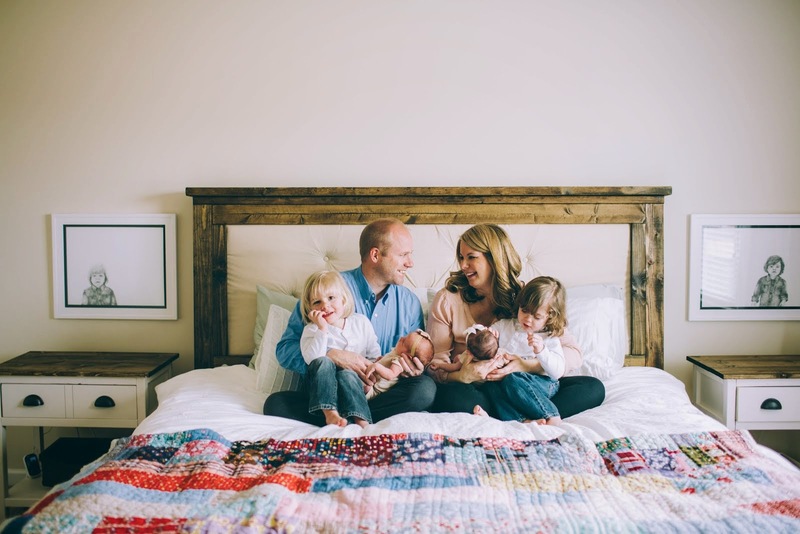 He loved his wife, family, friends, church and Lord endlessly. He had a mischievous smile, which would be followed by a soft chuckle, that I will long to see and hear. He was a great hugger; I would love to get a Grandpa hug as I walked in and out of the door of his house. There was never a time that I left his house without learning something new (or old) about him, his family, or how to do something. Like the time he taught me to change a kitchen faucet. He was not feeling great and instructed me how to change out the entire faucet from the kitchen chair (truth be told, if Grandma had not been home with a watchful eye, he would've done it himself!!) The only instruction he 'forgot' was not to leave the wrench clamped on the pipe and let go.. it will fall off, you will get a bloody lip, and he will have had a good laugh! *If you note the flashlight in the background... something that Grandpa taught my dad and something that was passed along to me... how to hold a flashlight for someone else. The flashlight holder is an important job, if you don't believe me, ask someone to hold a flashlight for you when you are trying to work on something in a dark space and you will realize quickly that having a "qualified" flash-light holder is VERY important. It is also important when you do not have a flash-light holder to know how to position your own flashlight, as in this picture... all grandpa taught! Dad mentioned this at the funeral and we all had a small chuckle, just as he would. I loved finding this picture! I loved Grandpa very much. I loved everything about him. I loved his pure sweetness. I loved his heart. He was one of a kind! I am such a lucky girl that "Grandpa James" was MY grandpa! He will be forever missed. I'm grateful for the time I had with him and the legacy he leaves behind. I'm also grateful that he passed every wonderful trait he had to my dad! I see so much of grandpa in him... his demeanor... slow-to-anger, quick-to-love heart... his love for others, his gentle spirit, and his love for the Lord. Thank you, Grandpa, for being a man of integrity, a man that others could look to as an example of what it meant to be Christ-like. Thank you for raising my dad to be the father I have today. I know the Heavens rejoiced in your Home-coming and we will see you again one day. You will forever hold a special place in our hearts and we will miss you greatly! The boys' first visit to Gma & Gpa's house at 6 weeks old. The Easter Bunny left gifts for P&H at MawMaw and PawPaws, one of which was this little pool. It has been so HOT here, that we broke it out! 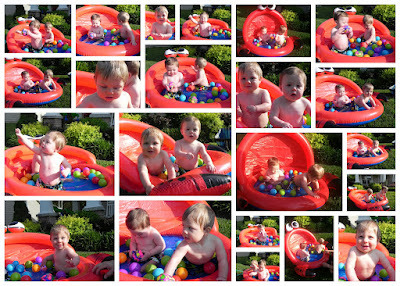 We took the balls from their "ball pit" (the pack-n-play filled with plastic balls) and put them in their pool! The boys had so much fun. Feeding: Drinking formula from sippy cups and cups with straws. Feeding self with fingers. Every once in a while, they get juice. I'm not a juice fan, due to the sugars, so I cut it with lots of water! They eat mostly table foods. Grilled Cheese, Scrambled Eggs, ANY Fruit and ANY Vegetables (They are definitely my kids, I LOVE veggies!). Mac and Cheese, Hot Dogs (skinned, of course), Hamburgers, any meal with Chicken, Spaghetti, Lasagna, Manicotti, Rice and Beans from the Mexican Restaurant. Oh, and they could eat their weight in biscuits!! Hayes can let go of furniture and remain standing. Language: Both boys say "dada"; Parker says "mama"
Last Summer Aunt Ashley brought the boys back their first pair of shoes from Paris. 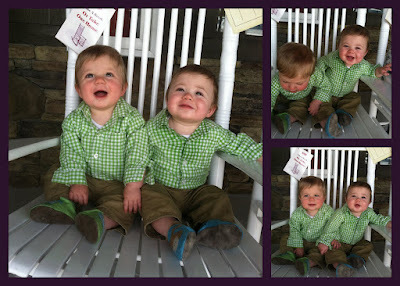 I figured I should get some pictures of them before they are completely worn out! 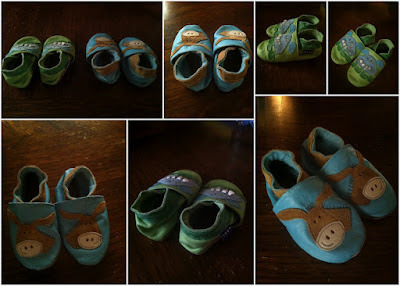 We absolutely love these shoes! Sticking with the blue/green theme... Hayes's are the green ones and Parker's are the blue ones.